Spring Opening on March 8-9! The Thrift House is celebrating 75 years in 2015, a milestone for any merchant. 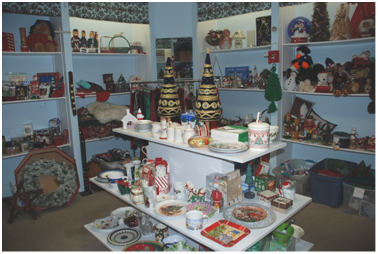 In 2016 JLE-NS remodeled the Thrift House with new features that offer a more welcoming shopping environment, an improved customer experience and a more curated selection of high-quality, gently used merchandise, including women’s clothing, men’s clothing, accessories, jewelry, housewares and home décor. To view highlights of the re-opening or photos of the new store click here. Goods for a greater good. All net proceeds go directly into the community through a combination of League-sponsored volunteer projects, community grants and scholarships, and development of leadership skill of our members. Since 2009, Thrift House has been the home of JLE-NS’s Fitting Futures, the League’s community outreach project that provides free, interview-appropriate clothing and job readiness sessions for low-income women. The Thrift House offers voucher programs to other non-for profit organizations, including Mary Lou’s Place (the Evanston YWCA Domestic Violence Shelter), enabling clients to shop at the Thrift House at no charge. Our community partners, including Connections for the Homeless, benefit from Thrift House by receiving our re-donations (useable items on their wish list that have been unsalable at the shop). Whether you’re a bargain-hunter, a parent of growing kids, a student on a budget, or someone who likes to shop for treasures, you’ll find constantly changing merchandise of great finds. Come in today and discover our wonderful selection of women’s and men’s clothing, accessories, jewelry, small furniture, books, home décor, house wares, and much more—all at great prices! Be sure to check out our new designer area where you will find labels such as Coach, Prada, Cole Haan, St. John and Kate Spade. The Thrift House accepts, with gratitude, new or gently used clothing (including designer labels), shoes, jewelry, accessories, small furniture, home decor, house wares and books. Your donations are tax deductible and all proceeds go to support our mission. If you are interested in making a donation to Thrift House, please drop off your gently used items at our store located at 920 Chicago Ave in Evanston. Donations are accepted at the Thrift House any time it is open (see hours below) or please call Thrift House directly at (847) 328-5778 to coordinate your donation. Thank you for helping us to continue serving our community. Become a fan on Facebook! Visit our page.